I’m four episodes into Star Trek: Discovery, and I have thoughts. The first few minutes of Discovery are promising: Georgiou and Burnham have chemistry. Georgiou is quirky, clever, professional. She’s got the cheesy flair of a great Star Trek captain. And yeah, seeing a new kind of face adding diversity to the captain’s chair is refreshing. But like it or not, Georgiou is currently being digested by Klingons. At least I have flashbacks to look forward to. Georgiou’s loss aside, the show has made fumbles: The internet jumped on the biggest one right away, namely our Vulcan-raised genius main character’s hysterical and poorly executed mutiny. Burnham needs to practice her neck pinch… Georgiou was out for like, what, 3 minutes? In short, the mutiny looked rushed and absurd, yet is now a key foundation of Burnham’s character and the ongoing plot. It’s a shaky start. The believability of the mutiny seems to rest partly on Burnham’s absolute faith in her adoptive father… Hopefully that father/daughter relationship will be explored later on. To be fair, though, beginnings are often bumpy, even for Star Trek. 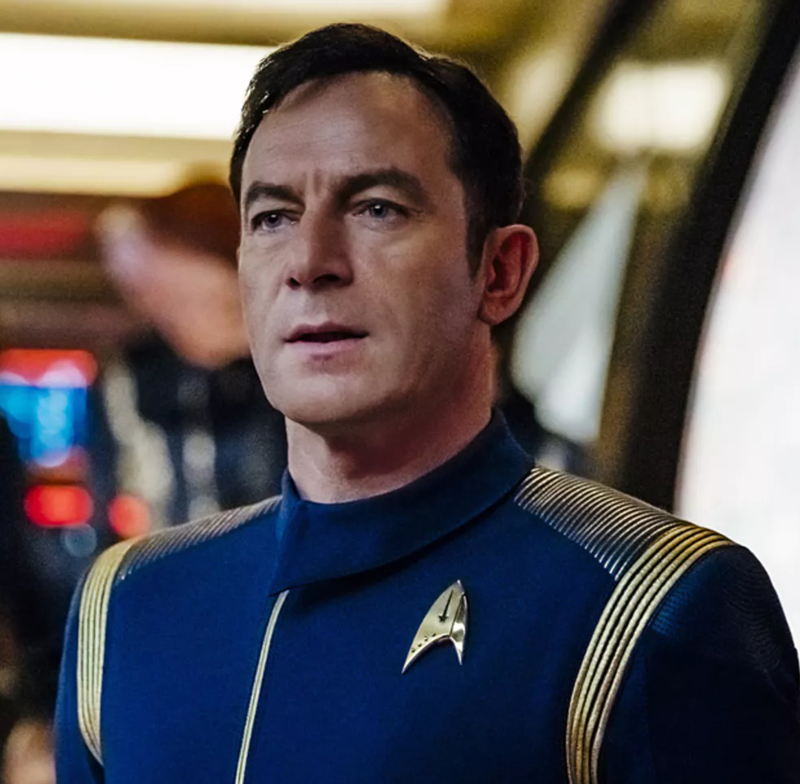 So what about Captain Gabriel Lorca? Our captain for presumably at least the rest of season one? In a two-episode story arc bridging Seasons 5 and 6 of Voyager, Janeway rescues Captain Ransom and his small science vessel, the Equinox. That’s remarkable because Janeway and her crew are stranded in the uncivilized, unstable, violent Delta Quadrant, something like 70 years from Earth. Captain Ransom, unlike Janeway, has cracked under the intense pressure. 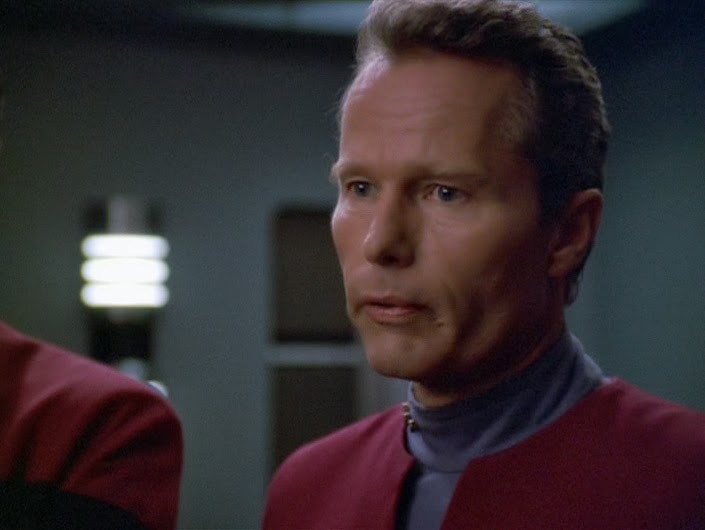 He has abandoned Star Fleet principles and begun systematically kidnapping and murdering aliens from another dimension to extract a unique compound from their corpses. That compound, his skeleton crew has discovered, can fuel their ship and superpower their warp drive. That compound can grant Janeway and Ransom what they both want most: the ability to get their crews home. The Equinox episodes are dark, and they work. Morality is put on trial. How long are we expected to maintain our moral code? Under what pressures is it acceptable to sacrifice morality? Do we have to value “other” lives as much as the lives of our own people? Janeway’s staunch adherence to Star Fleet principles is what has trapped her crew in the Delta Quadrant in the first place. Ransom’s abandonment of those principles, and his resulting success, is unacceptable. She hunts him down mercilessly and, ironically, almost at the cost of her own morality. In the end, Ransom achieves some redemption. 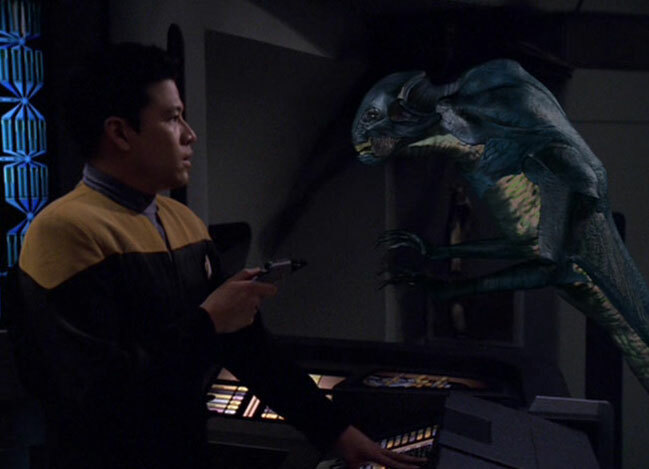 By sacrificing his ship and himself, he ensures that Voyager and his remaining crew members are spared from the aliens’ vengeance. But even at his worst, Ransom isn’t a captain you can entirely hate. He is tortured, torn, and constantly challenged. Discovery seems to have plunked Burnham into a poorly constructed Equinox in many ways. Yeah, the CGI is better. But even though similar questions look pending for the crew of Discovery, the framework is far less compelling. The Equinox aliens are self-aware, capable of communication, and literally being murdered. Ripper, so far, is basically a very gifted buffalo that’s being zapped with a cattle prod. If Ripper remains more “animal” than “human”, the debate loses its magnitude… Discovery basically becomes Okja in space. More concerning, Lorca lacks the complexity of Captain Ransom. Lorca likes war and (seemingly) always has. I assume we’ll get more backstory in episode five, but that deadly weapon collection wasn’t assembled overnight. He is cruel and manipulative towards his crew. He doesn’t elicit growth in ability through demonstrating trust; he browbeats results out of his officers. Lorca feels one-dimensional so far. I don’t anticipate that we’ll see him learn, grow, or change as a character. And as a result, he seems at grave risk of being boring, no matter how many weird monologues Jason Isaacs delivers in dimly lit rooms. He’s essentially the same character as his forgettable head of security, who thankfully has been disposed of via a scene so laughably inane it seemed like a metaphor for how little attention her character got in development. Right now, I’m hoping to see Burnham get more dialogue. Let her talk with her roommate instead of stifling the poor girl (who thus far is the best character alongside Saru). Let Burnham respond with something other than questions, and let her participate beyond spouting encyclopedic recitations. Past Vulcan characters have dominated dialogue and delivered some of the show’s most memorable lines. Being logical doesn’t mean you lapse into sulky silence at every opportunity for meaningful interaction. 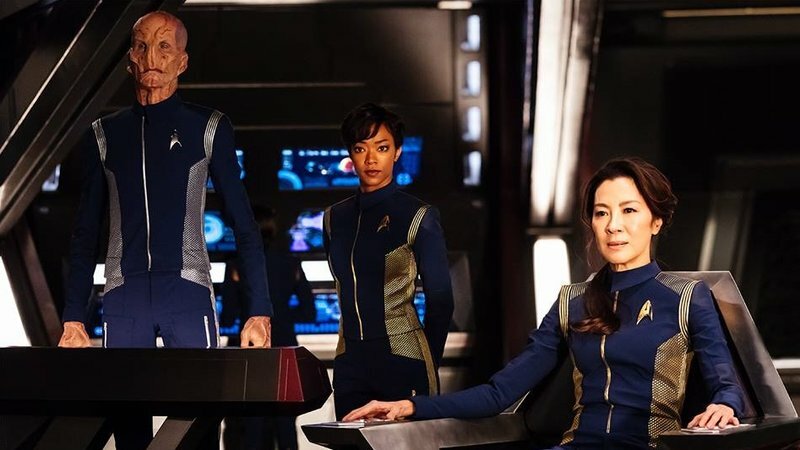 So far, Discovery feels a bit like someone came up with a semi-solid science fiction series plot, but didn’t want to put in the hard work of creating their own universe OR couldn’t risk people not watching… so they awkwardly jammed the plot into the Star Trek universe. I fear that the show is going to devolve into Kirk worship that’s mostly Star Trek fan fiction… I was really holding out for something more thoughtful. But regardless, I’ll keep watching, and I’d love to be proved wrong. Finally, regarding the Klingons, I don’t have much to say yet: Too little blood wine, too much religion. Yes, they’re stunning visually. But beauty is just a perk, not substance. Here’s to hoping the Klingon Matriarchs deliver a real punch. ← What Does It Mean To Kneel? Love this! Admittedly I’m not a Trekkie, but I think it’s great to write/publish thoughts simultaneous to watching the series. It’s like, marginalia for visual media. Thanks for writing. I look forward to reading more! Haha, thanks for reading! It is fun to “actively” watch a show, even if most of my discussions about it are with kind souls who just mercifully nod along.